Ten artists were feted June 6. 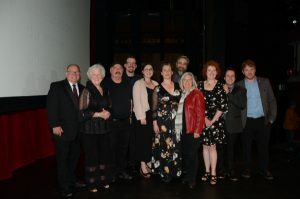 Outstanding Sudbury artists were honoured by their peers Wednesday evening at the Sudbury Theatre Centre. A special award, the Sudbury Arts Council President’s Award of Distinction, was presented to Iona Reed Pukara, a world class musician who has shared her love of music with audiences around the world and has mentored thousands of students. Complete biographies and other information about the Mayor’s Celebration of the Arts is in the attached program. The Mayor’s Celebration of the Arts awards were presented to actor, director and producer Alessandro Costantini (Emerging Artist); director, actor, playwright and designer Miriam Cusson (Mid-Career Artist); and Daniel Bédard, composer, sound designer, producer, musical di­rector and musician (Excellence in the Arts). The winners were each presented with a $2,500 bursary to help each continue their work. Six finalists: writer Danielle Daniel, performer Max Merrifield, writer Kim Fahner and musician Edouard Landry, musician and promoter Paul Loewenberg and publisher denise truax each received bursaries of $500. The Mayor’s Celebration of the Arts is produced by Regroupement des organismes culturels de Sudbury (ROCS) and The Sudbury Arts Council (SAC). These organizations have worked together to produce the Mayor’s Celebration of the Arts for the past five years. During this time, the organizing committee has raised more than $50,000 to support artists in our community. This year’s generous supporters are title sponsor RBC, presenting media sponsor EastLink, Fidelity Investments, Agilis Network, @home Energy, Sudbury Credit Union, Journal Printing, Northern Life, Le Voyageur, and Le Loup FM and Sudbury Living Magazine.